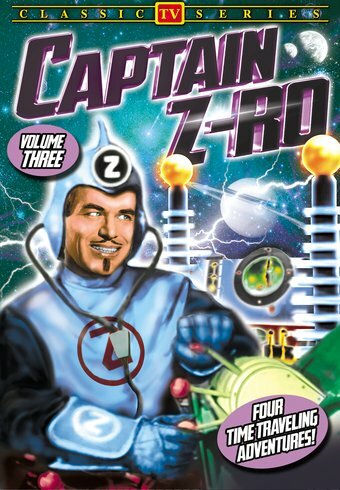 Captain Z-Ro, explorer in time and space, in four exciting episodes of this classic sci-fi show from the early days of television. Unseen in decades, Captain Z-Ro has been lovingly transferred from the original 16mm prints to ensure the highest quality. Included are the Captain's concluding admonishments to join his fan club, "The Z-Ro Explorers in Time and Space!" MOLLY PITCHER: Captain Z-Ro helps Molly Pitcher bring water to wounded Revolutionary War soldiers. Molly is played by Roy Steffens's wife, Kim. LEONARDO DA VINCI: Jet risks his life to test the ornithopter, Leonardo da Vinci's prototype flying machine. KING JOHN: An assassin in the employ of King John threatens to prevent the signing of the Magna Carta. PONY EXPRESS: Captain Z-Ro and Jet learn that a rival stagecoach company plan to destroy the Pony Express. Courtesy of Roy Steffensen and Fred Berney.